Durians - Get the nutritional facts right from Changi General Hospital's Dietetics and Food Services department. ​​are high in calories, but they have good monounsaturated fats as well. Contrary to popular belief, you will not have a big spike in your cholesterol level after eating a durian. In fact, this king of fruits has good monounsaturated fats that can actually lower your harmful cholesterol levels and moderate your high blood pressure. But feasting on this highly nutritious fruit will certainly not benefit your waistline. A durian can have anywhere from 885 calories to 1,500 calories depending on its size. 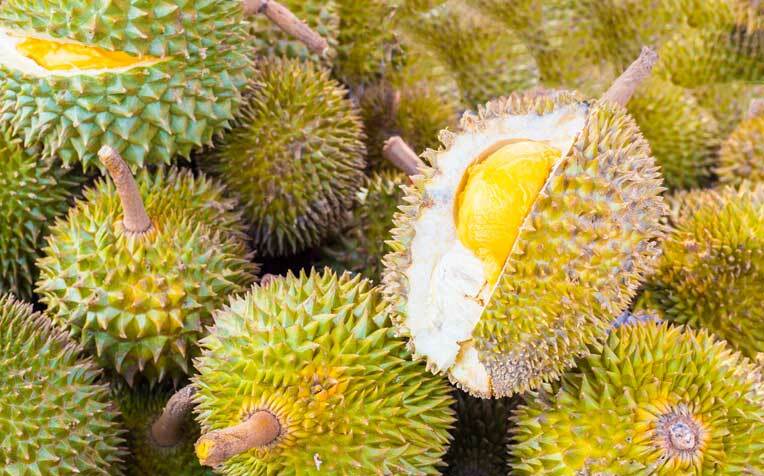 Durians may be a very good source of nutrients, but they are also high in calories and carbohydrates and thus must be consumed with moderation. With an average 1 kg sized durian having close to 1,350 calories, eating one durian can rack up as much as 68 per cent per cent of the daily 2,000 calories recommended for an average adult! One seed durian (about 40 g) has 54 calories. Total fat 32.1g (mostly monounsaturated fats) ● That’s nearly 50% of the daily nutritional requirement. Total carbohydrates 163.1g ● That’s over 50% of the daily nutritional requirement. Dietary fibre 22.9g ● Good. That’s 92% of the daily nutritional requirement. If you have diabetes and must count your carbs, you cannot feast on durians because of the fruit’s high sugar content. Durians contain simple sugars – sucrose, fructose and glucose. Because of their high carbohydrate content, durians can help replenish low energy levels quickly (in healthy individuals). The fruit’s high potassium content can also help reduce fatigue and relieve mental stress and anxiety. Having durian and beer at the same time will kill you -- true or false? Click on page 2 to find out! How Much Calcium Should Teenagers Get Daily?